Old Navy Black Friday Pre-Sale is on now! 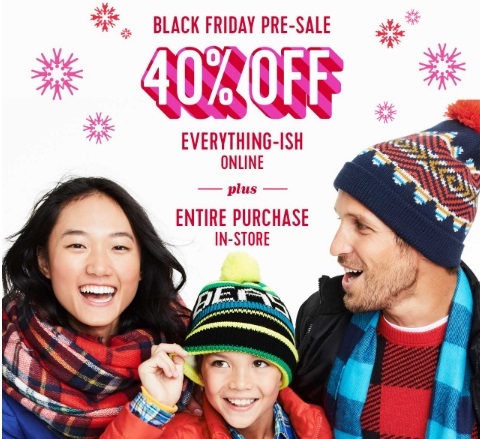 Save 40% off everything-ish online plus get 40% off your entire purchase in-store! No promo code is needed, discount comes off at checkout. Offer not valid on Clearance, Register Lane Items, Jewelry, and Today Only Deals merchandise in stores. Offer not valid on Everyday Steals, Hot Deals, Today Only Deals and Clearance merchandise (merchandise ending in $.97 and $.99) online. Offer is valid through November 22, 2016.